Dry skin brushing is an age-old health and fitness technique that has been used by Russians and Scandinavians to promote healthy skin. The Japanese love to brushed their skin before a hot bath. 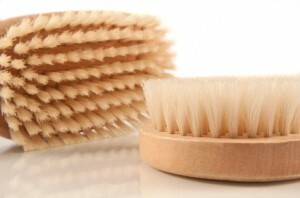 Regular skin brushing helps eliminate harmful elements from the body and improves blood flow and lymphatic circulation. 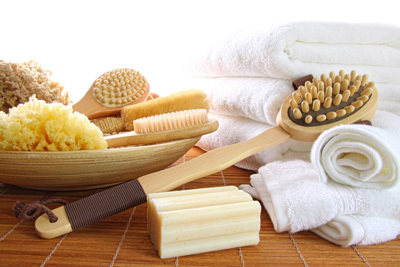 Skin brushing also stimulates new skin growth. Skin brushing should take no longer than 10-15 minutes. You can do this morning or night. You don’t need sophisticate equipment for dry skin brushing. All you need is a natural bristle body brush (with a long handle, for those hard to reach areas) and with the following simple tips, you can easily gain the best results from your skin brushing routine. Different areas of the body require different levels of pressure. Tough areas like the sole of your feet, upper buttocks and elbows should be brushed with firm pressure. On the other hand, pressure susceptible areas like your inner thighs, abdomen and chest should be treated lightly. Dry skin brushing is better done in the morning as then it is easier to wash the impurities off by taking a shower in readiness for the day. For long-term benefits clean-up your brush with hot soapy water and leave it to dry in the sun. If your brush bristles look ragged, then you should consider replacing it with a new one. When you have completed your dry brushing, take taking a shower, then apply a moisturizer before the skin is completely dry. This will help keep it soft, smooth and hydrated. Improper dry skin brushing can irritate or even injure the skin. It is best to start with a soft brush with a detachable head with a sufficiently long handle. Listed below are the steps you need to follow. Find a well ventilated room where you can comfortably undress. The room should slightly warm with a comfortable couch to sit on. Once undressed, brush your left leg moving the brush gently in a circular upward motion. Special attention should be drawn to the sole, ankles, knees, thighs and finally the buttock area up to the waistline. Go easy while brushing the inner thigh region. (Repeat these steps with the right leg). Focus on your back. Move the brush from the lower back to the upper back (particularly up to the shoulders). Brush a couple of times to get rid of dead skin cells and to improve blood circulation. Brush your right arm beginning from the palm to the elbow and finally to the upper arm taking care to cover both the front and the back of your arm. (Repeat the same steps with your left arm). Next brush your chest, breasts and abdomen in light circular strokes. Please note that this area is highly sensitive to pressure and so apply minimal pressure. Lastly glide the brush on the section beginning from the ears to the underside of your chin. Again excessive pressure must be avoided. Once done, take a shower, firstly apply warm water to the body, then quickly turn on the cold water for approximately 10 seconds, then turn on the warm water again. Repeat this process a couple of times. This will help increase the circulation even further. Loofah the body with soap to further remove any dead cells. Rinse your body and make sure you turn on the cold water for a few seconds to close your pores. Towel dry yourself and moisturize your skin with body lotion or oils. Dry brushing stimulates your liver, gut, kidneys, lungs, lymphatic system and nervous system resulting in improved functioning of the body. Exfoliation of dead skin cells from different parts of the body. Regular brushing helps get rid of accumulated dirt and unclogs pores and follicles for better skin growth. It also helps to stop ingrown hairs from developing. Buffed skin looks fresh, glowing and breathes better. Cellulite is a predominant problem affecting many people today. Dry brushing over problem areas help stimulate circulation and over time can help reduce cellulite. Studies show that daily brushing can help re-distribute fatty deposits on the surface of your skin- leading to reduced cellulite. Many experts recommend dry skin brushing for elimination of stretch marks and for tightening of loose skin. Well, the great news is that this not only works on your skin but also improves the functioning of some of your strategic inner body organs. So if you’ve just been dreaming about a glowing skin and a healthier body system; it’s high time you refreshed your life with a dry skin brushing session.